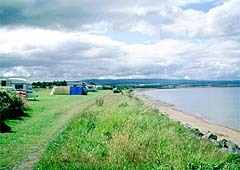 The site is based on the shore of the Rosemarkie Bay and is open to members and non-members alike. Caravans. motor caravans and tents are all catered for with are electric hook ups. Facilities include toilets, showers, washing-up sinks, laundry, toilet and hand basin for the disabled, chemical disposal point. Advance booking is recommended in high season. Directions: From the A9 at Tore roundabout take the A832 Fortrose to Cromarty road. Continue through Fortrose then turn right at the police house, signpost 'golf course & leisure centre'. Down Ness Road take 1st left, signpost 'golf course and caravan site'. Follow the road 400yds to site entrance. 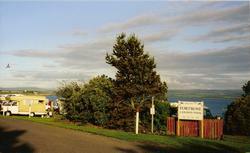 Fortrose Bay Campsite is situated in an ideal location for touring the Scottish highlands. The site is located on the shores of the Black Isle, overlooking the Moray Firth, near to Chanonry Point, which is considered one of the best places in Europe to view bottlenose dolphins. Onsite Facilities - 50 Tourers/Motorhomes/Tents, 50 Hookups, Seasonal Pitches Available, Toilets, Showers, Chemical Disposal Point, Dish-washing, Pets Allowed, Gas, WiFi Internet Access, Laundrette, Fishing, Water Sports, Pebble Beach. Offsite Facilities - Food Shop 0.5m, Bar/Pub 0.5m, Restaurant 0.5m, Takeaway Food 0.5m, Indoor Heated Pool 13m, Tennis Courts 0.75m, Golf Course Adjacent to Park, Horse Riding 1m. See How to Get Here for directions to Fortrose then turn right at Academy Street (opposite the Bank of Scotland) 0.5 mile.